Is Burma’s Opposition Ready for the Post-Suu Kyi Era? Female drug users in Myanmar face extra stigma, often go unnoticed and receive little help with kicking their addiction. MYITKYINA, Kachin State — Ja Mai started smoking opium six years ago to alleviate pain. In Hpakant Township where the ethnic Kachin former gem merchant used to live, it was not hard to find illicit drugs. The government-controlled township in Kachin State, which hosts some of the world’s richest jade mines, is also teeming with illicit narcotics. Many mine workers and others succumb to the abundance of available heroin and opium. Ja Mai was able to keep her opium addiction a secret for some time. As a middle-aged mother of two, few would have suspected her to be an addict. But her family knew, and after she started smoking heroin last year, her adult offspring convinced her to enter the All Nations drug rehabilitation center in the state capital, Myitkyina. Ja Mai has now been at the center for five months. 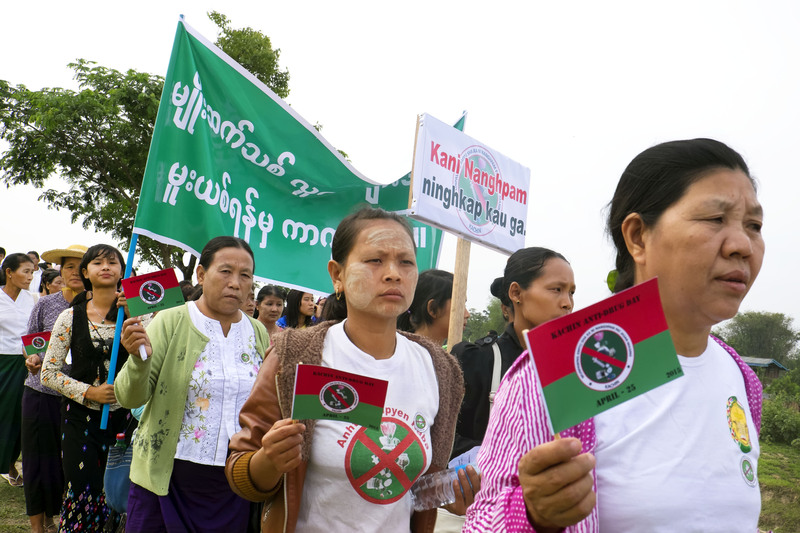 Drugs have long been a serious problem in resource-rich Kachin State. There are fewer female drug users than males, but females are often in more vulnerable situations and are less likely to receive help. “We face challenges covering them due to their invisibility and due to stigma,” said Dr. Tun Tun Brang, area coordinator of the Substance Abuse Research Association (SARA) in Myitkyina. 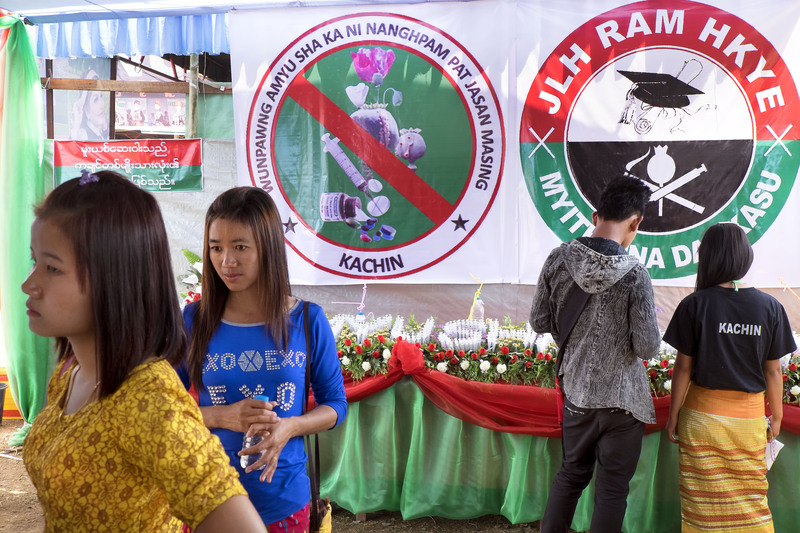 SARA is one of only three NGOs operating in Kachin State that offer harm reduction programs. Last year it gave away about one million needles, to help reduce transmission rates of HIV and other blood-borne diseases, in six townships in the state. Approximately thirty women were referred to a government-administered methadone program last year. 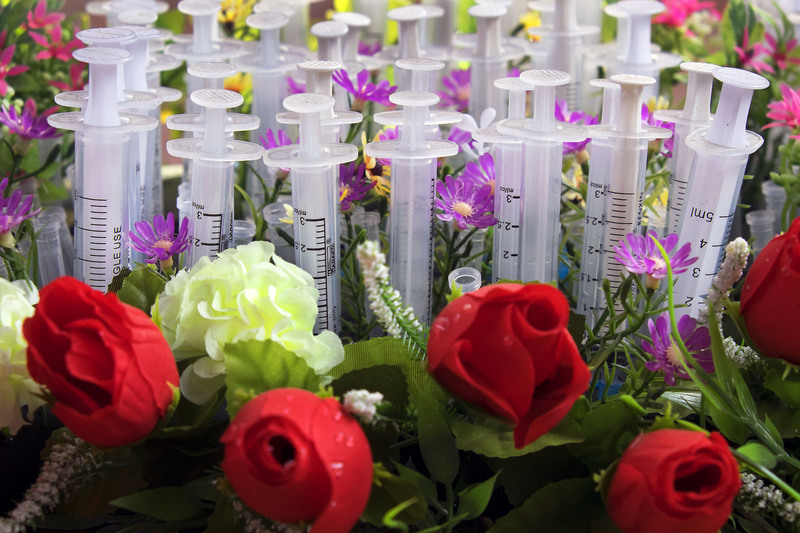 “Women who inject drugs often have limited or no access to harm reduction or general health services,” according to a United Nations Office on Drugs and Crime (UNODC) policy document. Mothers may also fear that their children will be taken from them if they seek help. SARA hopes to open a female-only drop-in center to encourage more women to take advantage of its services. Nang Ra, 27, also from Hpakant Township, joined All Nations about a year ago. She is living with HIV and is a recovering intravenous heroin user. Today Nang Ra seems committed to rebuilding her life. She is a recent graduate of a pilot YMCA vocational training program that offered 42 recovering addicts, including five women, a rare opportunity to participate in on-the-job training for up to one year. Nang Ra worked at a beauty school for a year and soon she and fellow All Nations resident and YMCA graduate Hkawn San will open their own salon. For the Kachin mother of four, helping those affected by drugs is a personal matter. All Lu Lu Tin’s sons, except for the youngest who is 16, have injected heroin. Six years ago, she sold her house and land to start the All Nations center. There are at least 12 faith-based drug rehabilitation centers in Myitkyina, but All Nations is the only one equipped for female residents. Sometimes more emphasis is placed on helping males, Lu Lu Tin said. Yet female drug addicts are often in a more vulnerable position because of the way some acquire funds for drugs. She wants to do more to help female drug users in future. “I plan to enlist more females to join the vocational trainings,” she said. This article originally appeared in the August2015 issue of The Irrawaddy magazine.